Dubai, UAE, June 10, 2018: Collecting its second design award this year, Swiss watch brand Rado has once again proven its status as a forward thinking player in the design world. This time the brand has received the prestigious 2018 Australian Good Design Award® for the True Phospho - a collaboration with Swiss design studio Big-Game. Competing in the Product Design category, the True Phospho was evaluated on criteria including design, innovation and impact. 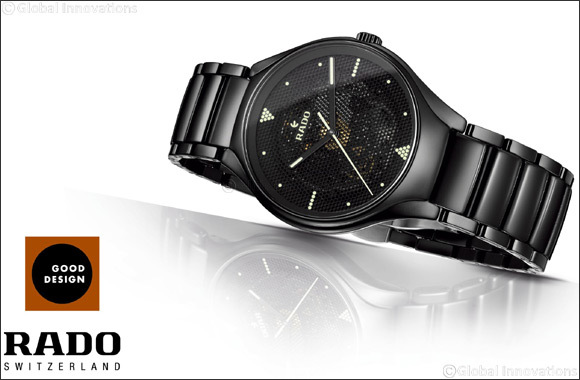 The Rado True is a signature Rado timepiece crafted in high-tech ceramic – the material for which the brand has become famous. Rado asked six renowned international designers to apply their individual vision to this popular model, under the theme of lightness and minimalism. Swiss design trio Big-Game created the True Phospho – a pared down piece that focused on removing, rather than adding design elements. Housed in a 40 mm matt black high-tech ceramic case with matching bracelet, the award-winning Rado True Phospho embraces minimalism, but with a typical Rado twist. The black brass dial is perforated, allowing the quality Swiss automatic movement below to shine through – a thoroughly modern approach to the traditional skeleton watch. The perforations also provide an opportunity for the application of the luminescent indexes, which are created by filling the empty spaces with Super-LumiNova® to create geometric shapes. Additionally, the hour and minute hands are tipped with Super-LumiNova, while the second hand is fully coated in the glow-in-the-dark substance. The watch was produced in a limited edition of 1,003 pieces – 1,000 for the general public, and one for each of the Big-Game designers. “At Rado, we are absolutely delighted to have won the prestigious Australian Good Design Award® for our collaboration with Big-Game. Our commitment to providing the very highest level of design we can is second to none and we are proud to be able to add another award to our collection,” commented Rado CEO Matthias Breschan.